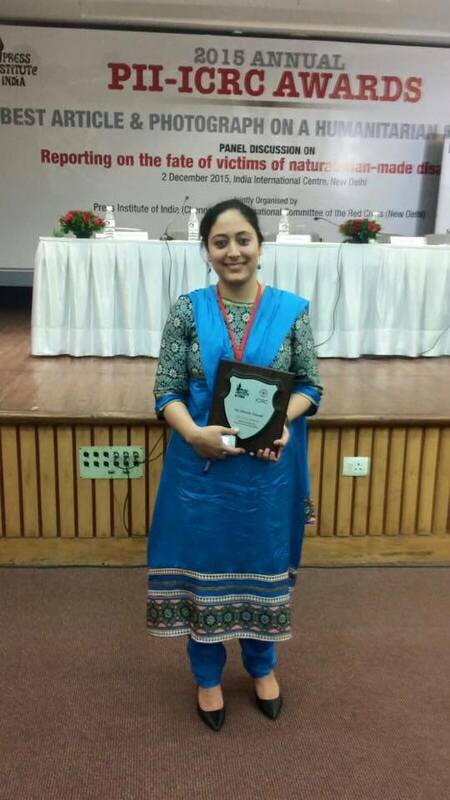 Kashmir Life former staffer, Shazia Yousuf has won top Indian award: ICRC – PII 2015.
International Committee of the Red Cross (ICRC) Wednesday declared winners of ICRC – PII (International Committee of the Red Cross – Press Institute of India) awards from India. Shazia Yousuf after receiving award in New Delhi. A statement issued by ICRC, New Delhi said that independent journalists across India bagged all the awards in “Best Article” on a humanitarian subject of ICRC – PII 2015 Annual Awards. Shazia, based in Kashmir, was awarded second position in this category, the statement announced. She had submitted her story: “India: Can You Imagine Life Without A Toilet?” for the ICRC – PII 2015 contest which was published by Women’s Feature Service in March 5, 2015. The awards were announced by Head of Regional Delegation at ICRC, New Delhi Mary Werntz. Neha Dixit, who is a New Delhi based freelancer, has bagged the first award. Shazia who comes from Old Srinagar did her bachelor’s degree in Biology and her Master’s in Mass Communication and Journalism from University of Kashmir. She joined Kashmir Life as Correspondent in 2009 and won Ford Foundation International Fellowship in 2011 after which she flew to Boston in United States to do another Masters in Print and Multimedia Journalism at Emerson College. Post her US study trip, she began writing women features for magazines and online news portals exclusively for women. 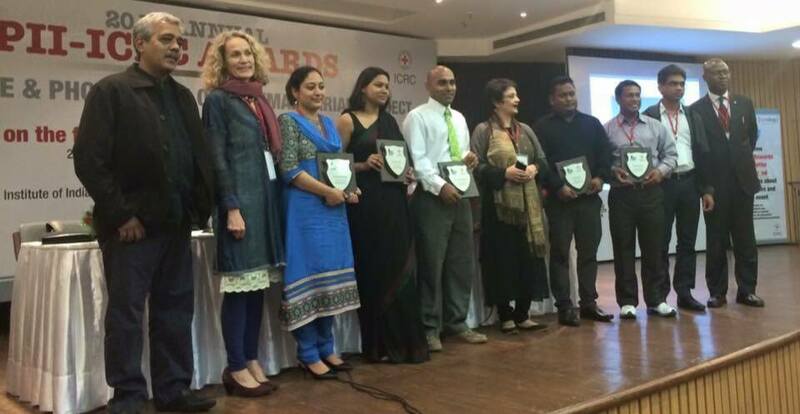 ICRC-PII Award ceremony 2015 in Indian capital city of New Delhi. Last year, she was awarded the Panos South Asia fellowship for her project on Women in Militarization, and is writing about Kashmiri women and their perspective of war. In her message to winners, Mary Werntz said, “I am hoping that our winners today will re-dedicate themselves to their profession and see the awards being given to them as a call to greater service not just for their profession but in the service of humanity”. The jury members for the press awards this year included Seema Mustafa, Senior Journalist and Author; Dr Jaya Shridhar, Journalist and Health Adviser; Srinivas Burra, Assistant Professor, South Asian University and Wasbir Hussain, Political commentator and strategic analyst. Earlier in 2011, another Kashmiri journalist, Baba Umar, has won this prestigious award in “Best Print Media” article on humanitarian issues after a panel discussion on the theme, “Media Reporting on the Fate of Victims of Armed Violence”. He was then working with New Delhi based Tehelka magazine. The ICRC and the PII started the annual competition in 2008 in an effort to recognize the work of Indian journalists in the field of humanitarian reporting, where they throw the focus on human suffering caused by armed violence and the extraordinary resilience shown by people in such situations. The ICRC is an independent and non-political organization with a large scope of activities which it undertakes through its presence in most countries. Its existence and activities are universally recognized and it regularly responds to the needs of people adversely affected by situations of humanitarian concern, in particular armed conflict and violence. PII is an organization working for upholding the standards of journalism in India through research and training programmes. Recently, a few other Kashmiri journalists were awarded top international and Indian awards for their work. Those awarded include Riyaz Wani (Tehelka), Dar Yasin and Mukhtar Khan (Both AP) and Irfan Hakeem (The Economic Times).